It’s important to know how much weight you’re carrying around-weight that could slow you down in a deadly encounter. I have heard this saying time and time again, though this time it has actually caught up to me. I’m not as young as I used to be, and I am now feeling the physical effects of the weight of my duty belt and everything else that I carry around with me on a daily basis. About a week before I began writing this article, I was involved in a foot pursuit. This was nothing glorious: A shoplifter decided to run upon catching a glimpse of me heading his direction. During the next quarter-mile, while he was weaving in and out of traffic—and carrying nothing but his bodyweight, a backpack with some stolen clothes and his adrenaline to flee—I struggled to close the distance on a man who was seven years my junior and about 60 pounds lighter between my bodyweight and gear. The suspect was eventually taken into custody a short time later. This had quite a mental impact upon me. I decided to do a preliminary weigh in: one in just undergarments, and one with all of my gear on as I was ready to walk out the door to work. There was around a 31-pound difference. I decided that I was going to individually weigh each and every piece of equipment that I wear from head to toe to see where I could shave some ounces by replacing some of my equipment while still effectively being able to perform my job. All of my gear, including everything I wear to work with the exception of my undergarments, weighed 30.94 pounds. There are some pieces of equipment, no matter how much they weigh, that are absolutely necessary and cannot be replaced or removed all together. 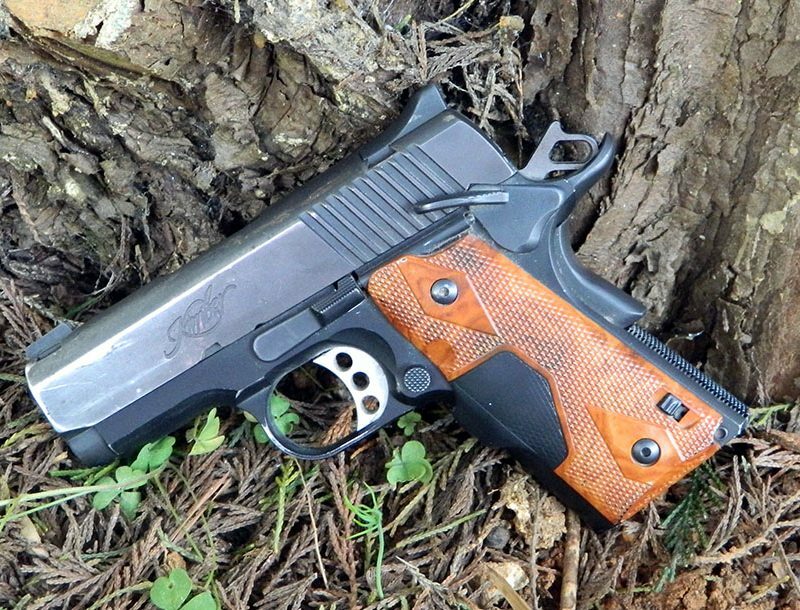 For example, my issued duty handgun, magazines and ammo, holster and portable radio are not replaceable with alternatives; however, there are some other ounces that I can shave from here and there from my other gear to help lighten the load. Our issued patrol duty uniform is a custom-fit jumpsuit made by a reputable local manufacturer. Aside from the functionality of wearing a jumpsuit for patrol functions, it’s wearing a pair of pajamas to work. We are offered the choice of either a winter-weight jumpsuit that stands up well to the rain and colder elements or a summer-weight version that has no water-wicking properties and is meant for warmer weather. Though choosing between the two styles depends more on weather than weight, it should be noted that there is a 25-ounce difference between the winter-weight jumpsuit (64 ounces) and the summer-weight (39 ounces). 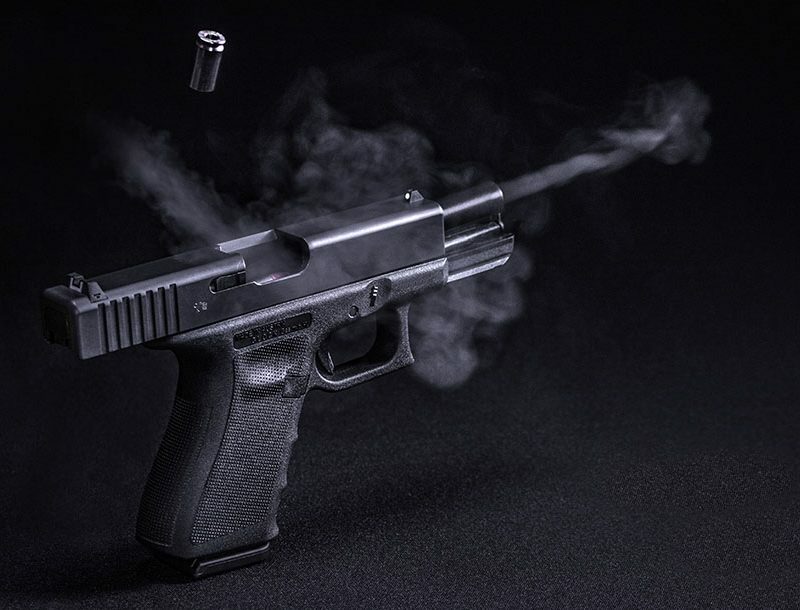 Weight can be a serious consideration in choosing a backup firearm. 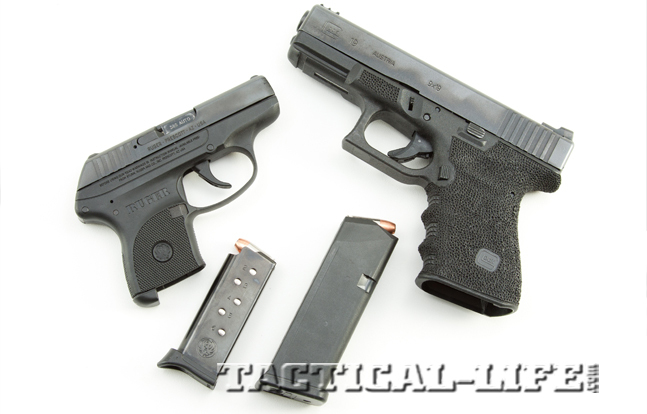 The author switched from a 9mm semi-auto to a reliable Ruger LCP in .380 ACP. 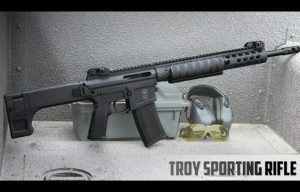 My current 9mm backup gun weighs in at 33 ounces with magazine and ammo. I replaced it with a Ruger LCP .380, which weighs 11.9 ounces fully loaded. 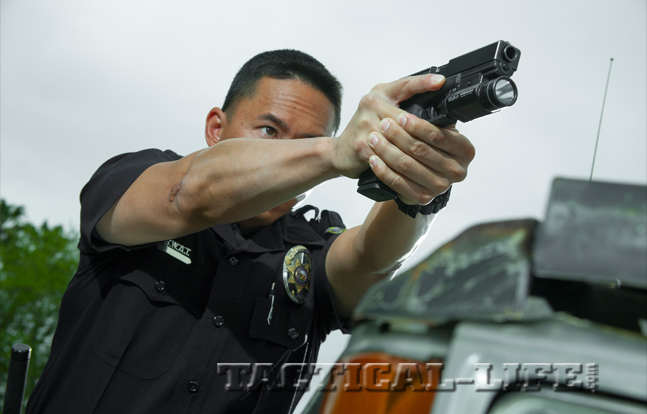 The weight savings of the LCP over the 9mm: 21.1 ounces. The boots that I had worn prior to this test were a pair that weighed in at 64 ounces all together. I found a pair of Lowa GSG Revo boots that are also waterproof and offer a lighter overall weight—16 ounces less than my previous boots. The Lowa GSG Revo boots didn’t require a break-in period and have held up very well to the elements. 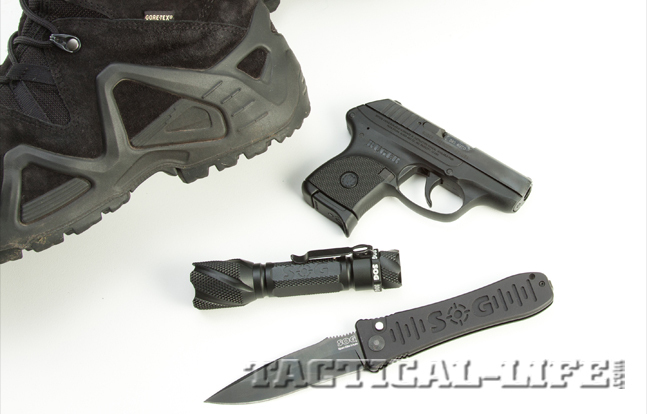 options include the BlackHawk Gladius Maximus (left) and the SOG DarkEnergy 247A (right). The duty belt that I was using was of the Bianchi AccuMold variety, with a Tactical Design Labs duty belt comfort panel (pad) attached to the inside. With the addition of a pair of Tactical Tailor duty belt suspenders (the most comfortable that I have found), the comfort panel was no longer necessary for spreading the weight on my hips, so dropping that saved me 8 ounces. 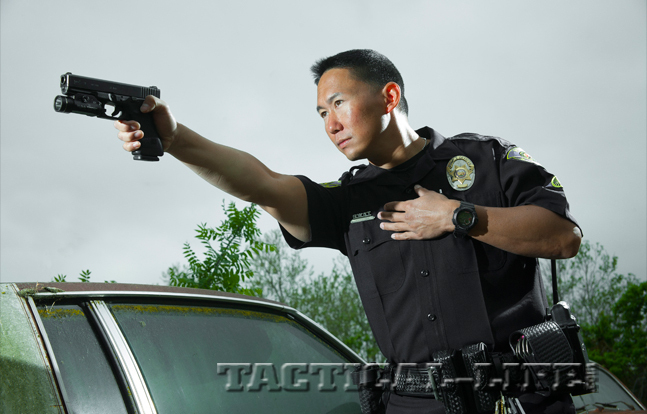 Though the Taser X26 is not a required piece of equipment, it is personally mandatory for me. My current setup includes the XDPM (Extended Digital Power Magazine) with an extra cartridge. The total weight of this setup is 14 ounces, and would only save around 2.5 ounces if I were to lose the extra cartridge and revert to the standard DPM. I prefer to have the extra cartridge on my person, so I’m fine with that extra weight. When you start throwing pens, keys, notebooks, note cards and paperwork into the pockets of your uniform, you don’t really realize how much the weight adds up to, or how much of it you are actually carrying. I lightened this load by dropping all of the non-essential keys, reducing the number of forms I had on my person, dropping a pocket calendar and a notebook, and sticking with 3×5 note cards for notes. This gave me a weight savings of 11.2 ounces. 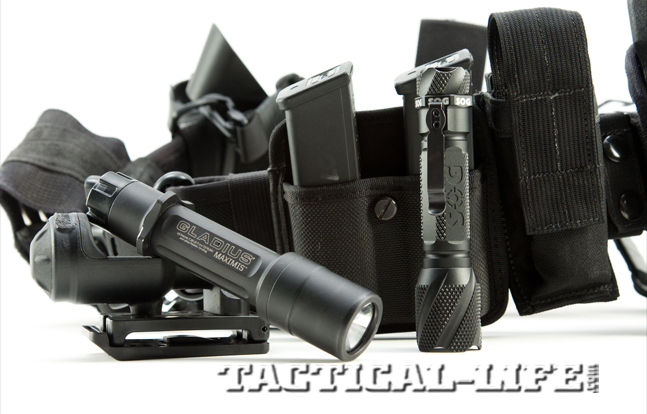 For the past few years, I have been carrying a great light that weighed 9 ounces with the optional Kydex light holster. During the search for lighter gear, I found a great replacement: the SOG Knives Dark Energy 247A, which more than doubles the lumen count (247 lumens). 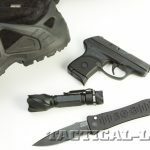 This flashlight, secured inside of a Tactical Tailor Knife/Small Flashlight Pouch, only weighs 5.5 ounces—a 3.5-ounce savings. Officers should always carry knives, and lightweight, durable options exist, such as the SOG Spec Elite II. I carry two folders. The combined weight of both knives was 12 ounces. Three quarters of a pound in cutting instruments surely adds to the weight being carried around. 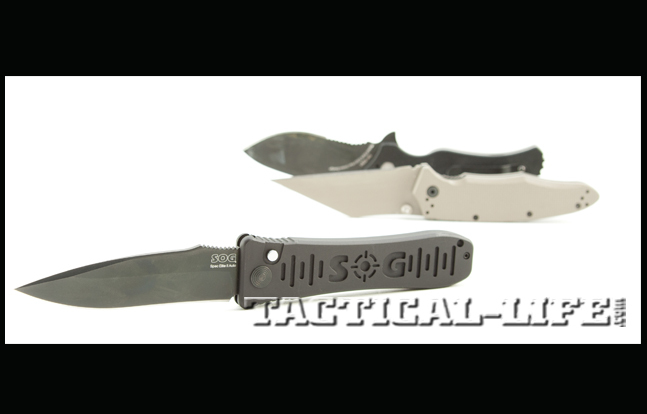 I opted to trade in the two previous carry knives for a SOG Spec Elite II Auto, which only weighs in at 3.5 ounces, for a weight savings of 8.5 ounces. During this test, I was able to reduce the amount of weight that I will have to carry around with me by roughly 100 ounces, or 6.25 pounds. I am sure that there are officers around the country who are carrying a lot more weight around that I started out with, especially those with leather duty gear. Many of the departments that we work for care for us as peacekeepers, but they also have to ensure that the department stays within its budget. 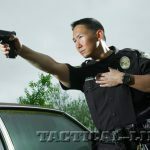 For the agencies that are lucky enough to be able to issue duty gear to their officers, buying the top-of-the-line product, or in this case, the lightest product, is not always feasible. Some of the burden is on us personally to ensure that we care enough for our bodies now so we may enjoy our later years. Stay safe out there!